Muḥammad Bāqir b. Muḥammad Taqī b. Maqsūd ʿAlī al-Majlisī (Arabic: محمد باقر بن محمد تقي بن مقصود علي المجلسي) (b. 1037/1628-9 d. 1110/1699) known as al-ʿAllāma al-Majlisī (Arabic: العلامة المجلسي) or the Second Majlisī (Arabic: المجلسي الثاني) was among the most famous Shi'a scholars in fiqh and hadith. Al-'Allama al-Majlisi was interested in hadith studies more than other Islamic sciences and was close to Akhbaris. His most famous book was the comprehensive hadith collection of Bihar al-anwar which played a great role in the revival of the significance of hadith in religious study. By educating students and writing many works, some of which were in Persian and for general readers, he influenced the Shi'a culture and scientific methods of later scholars. He was very famous due to his cooperation with Safavids and his influential social and political roles at that time. During the rule of Shah Sulayman Safavi, al-'Allama al-Majlisi reached the position of Shaykh al-Islam and was very influential during the rule of Sultan Husayn Safavi. 5 'Allama in the Position of "Shaykh al-Islam"
He was born in Isfahan in 1037/1628. He was born in the rule of Safavids and the last year of the rule of Shah 'Abbas I. His father, Muhammad Taqi al-Majlisi was among the noblemen and famous Islamic authorities of his time and one of the students of Baha' al-Din al-'Amili, 'Abd Allah al-Shushtari, and Mirdamad. Muhammad Baqir's mother was a daughter of Sadr al-Din Muhammad al-'Ashuri al-Qummi who was in a family of knowledge and virtue. It is quoted from Muhammad Baqir's father, "One night after the midnight prayer, I had a great feeling and just heard my kid's crying. I said to God, 'O God! By the rights of Muhammad (s) and his family (a) make this kid a preacher of Your religion and the rulings of the Master of Prophets (s) and bless him with limitless opportunities.'" It is also quoted from him that he ordered his wife not to milk Muhammad Baqir when she was not tahir. It is said that Muhammad Baqir al-Majlisi had three wives, four sons, and five daughters. Family of al-'Allama al-Majlisi is among the most honorable Shi'a families in recent centuries. There have been about a hundred pious scholars in this family. Muhammad Baqir's progenitor of his father was Abu Nu'aym al-Isfahani. He was among the hadith scholars and memorizers of the Qur'an. Muhammad Baqir's grandfather was Mulla Maqsud who is described as a pious poet and a knowledgeable scholar. His father's mother was the daughter of Kamal al-Din al-Hasan al-'Amili al-Natanzi al-Isfahani. Muhammad Baqir's brothers were Mirza 'Aziz Allah and Mulla 'Abd Allah who have been praised by Muhaddith Nuri. Amina Biygum was the most famous sister of al-Majlisi who was among the scholars of her time and the wife of Mulla Salih Mazandarani. It is said that since his grandfather held great majlis (religious gathering) or since he used the pen-name "Majlisi", his family became famous as Majlisi. Another report is that they became famous as Majlisi because Muahammad Taqi was living in the village Majlis of Isfahan. There is not much information about different stages of the education of Muhammad Baqir al-Majlisi. Apparently, he was educated by his father, Muhammad Taqi al-Majlisi (d. 1070/1660) more than any other teacher and because his father was among the students of al-Shaykh al-Baha'i, he and his father were influenced by al-Shaykh al-Baha'i's thoughts. Moreover, Muhammad Baqir al-Majlisi heard hadiths from many of the scholars of his time and received permission for narrating hadiths from those scholars such as Mulla Salih Mazandarani (d. 1081/1670-1671), Mulla Muhsin Fayd Kashani (d. 1091/1680-1681) and al-Shaykh al-Hurr al-'Amili (d. 1104/1693). Sources have mentioned 18 of his teachers. Muhammad Baqir al-Majlisi had many students and several classes. Some sources mentioned the number of his students more than 1000 people. Some of his students became famous Shi'a scholars such as Mirza 'Abd Allah Afandi Isfahani (d. 1130/1718), al-Sayyid Ni'mat Allah al-Jaza'iri (d. 1112/1701), al-Shaykh 'Abd Allah al-Bahrani (d. 1127/1715), Muhammad b. Ali Ardabili (d. 1101/1689-90), Mir Muhammad Husayn Khatun Abadi (d. 1151/1738-39) and Sayyid Abu l-Qasim Khwansari (d. 1157/1744-45). Al-'Allama al-Majlisi was knowledgeable in different Islamic sciences such as tafsir, hadith, fiqh, usul, history, rijal and diraya and wrote different works about them. He was a prolific writer and according to some calculations, he wrote about 67 lines of on average 50 words everyday during his scientific life (after the age of maturity). Al-'Allama al-Majlisi loved to compile hadith collections more than anything and his most famous work is Bihar al-anwar which is a great collection of hadiths from Imams (a). Returning to hadiths, compiling hadith collections and writing commentaries on hadith references was a movement promoted during Safavids which had roots in the efforts of Shi'a scholars and their answers to ideological needs of their time. Writing Bihar al-anwar was following the general attention of the scholars to hadiths and preserving them. Bihar al-anwar covered all human sciences reflected in the hadiths of Imams (a) and played the role of Shi'a encyclopedia at its time. Scholars at that time, including al-'Allama al-Majlisi, wrote such works with this idea that all sciences have divine roots and can be found in the sayings of Imams (a). Revival of Shi'a hadiths was an effort to provide the access of the public to authentic religious thoughts (which were reflected the most in hadiths of Imams (a)) and compiling texts to answer the questions of Shi'a and to prevent them from going astray. Therefore, al-'Allama al-Majlisi's work in compiling hadith collections is usually evaluated as a measure to strengthen Shi'a and thus, he has been considered as a reviver of Shi'a. Arabic works of al-'Allama al-Majlisi are mentioned up to 10 titles, most voluminous of which is Bihar al-anwar which has about 700 thousand lines and one of its prints is in 110 volumes. Al-'Allama al-Majlisi also wrote commentaries on old Shi'a hadith collections. In those commentaries, he discussed different issues including issues in fiqh. He wrote a commentary on al-Kafi and called it Mir'at al-'uqul. 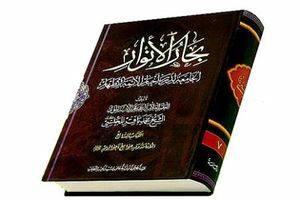 He also wrote a commentary on al-Shaykh al-Tusi's Tahdhib al-ahkam and titled it Maladh al-akhyar fi fahm Tahdhib al-akhbar. Some other works of al-'Allama al-Majlisi are Sharh chihil hadith, al-Fawa'id al-tarifa fi sharh al-Sahifa (which is a commentary on al-Sahifa al-Sajjadiyya), Risala i'tiqadat, Risala awzan and al-Wajiza fi al-rijal. Al-'Allama al-Majlisi wrote several books and treatises in Persian which have been counted up to 49 works. Previous to al-'Allama al-Majlisi, scholars wrote Persian treatises to promote religious sciences among common people, but al-'Allama's works became more famous and were better welcomed by Persians. Haqq al-yaqin on religious beliefs. Al-'Allama al-Majlisi was living when inclination toward hadiths and Akhbarism were common among Shi'a scholars. He was more than anything interested in hadith-related sciences and especially hadiths themselves and regarded hadiths from Imams (a) the most important source of receiving religious knowledge and religious orders and considered them superior to other Islamic sciences especially philosophical and rational sciences. In the views of al-'Allama al-Majlisi and many other hadith scholars of his time, hadiths of Imams (a) were not only a source of receiving the knowledge necessary for happiness in the hereafter and guidance of human being but were also an authentic and important source for all human sciences. Even with his interest in hadiths, many researchers of Islamic sciences have regarded him among moderate Akhbari scholars as he called his manner "the middle way" among the manners of Mujtahids and Akhbaris. Researchers and writers who do not consider al-'Allama Akhbari, have studied the works of al-'Allama al-Majlisi and found some disagreements between his views and some Akhbari approaches. For example, al-'Allama al-Majlisi did not completely reject the validity of reason as Akhabris do and in some places in his works, he considered intellectual theoretical knowledge as the way of understanding the principles of religion. In some cases, he also used rational arguments and philosophical language and terminology in explaining and interpreting some hadiths. Also despite Akhbaris, al-'Allama al-Majlisi studied rijal and wrote a book about it. He believed in the authority of the literal meaning of the Qur'an and did not believe in prohibition of the usage of things about permissibility of which there is no clear text and followed the principle of permissibility. Opposite to this view, some writers referred to some of the opinions of al-'Allama al-Majlisi which agreed with those of Akhbaris and considered him a follower of Akhbari school, saying that al-'Allama al-Majlisi did not regard reason valid and considered sayings of Imams (a), the main way and even the only way to reach religious teachings, even in the principles of religion. Like Akhbaris, he considered understanding the Qur'an possible only through hadiths of Imams (a). He believed that the primary reason in religion is tradition and that when rational and traditional reasons disagree, priority should be given to tradition. Al-'Allama al-Majlisi was against philosophical intellectualism and criticized some philosophical ideas in his works. He criticized some views of Muslim philosophers because of following Greeks and leaving the Qur'an and Islamic narrations. He considered the usage of intellect permissible only if its findings are in agreement with religious principles. In his works, he has criticized the opinions of Muslim philosophers and has regarded some of these ideas opposite to essential principles of religion. Believing in creation of the world in time, materiality of angels and corporeal resurrection are among the opinions of al-'Allama al-Majlisi in which he opposed philosophers. In these opinions, al-'Allama al-Majlisi supported his opinions by hadiths and criticized the opposition of philosophers' ideas with hadiths. His opinions were later opposed by some Islamic philosophers; for example, 'Allama Tabataba'i criticized the opinions of al-'Allama al-Majlisi and considered them contradictory. He considered al-'Allama al-Majlisi's entering deep rational discussion a mistake of his. Although in some of his works, al-'Allama al-Majlisi used rational and philosophical arguments, he rejects the usage of rational arguments, when he discusses the way of achieving religious knowledge regarding principles of religion. He believed that since the reason makes mistakes, referring to it in religious issues is not permissible; while in his works, he considers traditional arguments valid for learning the principles of religion. This is against the opinion of most Muslim scholars who consider intellect, the way of learning the principles of religion. Like some other scholars of fiqh at that time, al-'Allama al-Majlisi criticized Sufism in his works and regarded their thoughts, habits and manners against the teachings of Imams (a). Some Sufi manners and thoughts al-'Allama al-Majlisi criticized, included their neglect of religious rulings, prevalence of non-religious manners and rituals among them such as Dhikr circles, Sama' and esoteric interpretation of religion and religious texts. As it can be learned from some works of al-'Allama al-Majlisi which some contemporary writers have confirmed, al-'Allama was not against asceticism and self-purification if they are in accordance with religious manners and the appearance and the heart of religion and the important issue for him was following religious rulings. Thus, he considered some Shi'a scholars as Twelver Shi'a Sufis such as al-Shaykh Safi al-Din al-Ardabili, Sayyid Ali b. Tawus, Ibn Fahd al-Hilli, al-Shahid al-Thani, al-Shaykh al-Baha'i and his father, Muhammad Taqi al-Majlisi as Imami Sufis. He praised them (and distinguished Twelver Shia Sufi from those Sufis who followed Sunnis). In some instances in his works, he has provided some mystical interpretations for Imams' (a) hadiths. 'Allama in the Position of "Shaykh al-Islam"
In 1098/1686-87, during the rule of Shah Sulayman Safavi, al-'Allama al-Majlisi reached the position of "Shaykh al-Islam" when he was 61 years old. After the death of Shah Sulayman Safavi, when Sultan Husayn sat on the throne, al-Majlisi was retained in the position of Shaykh al-Islam. During Safavids, this position received religious taxes, supervised the implementation of religious rulings and judiciary system, managed schools, mosques and shrines, appointed the leaders of congregational prayers and managed religious issues in the country. Actions of al-'Allama al-Majlisi in the position of Shaykh al-Islam during the kingdom of Sultan Husayn Safavi were followed by different and contradictory reactions among researchers and historians. Some historians pointed to the great power of al-'Allama al-Majlisi during the rule of Sultan Husayn and illustrated a picture of him as a prejudiced person who harassed religious minorities. In that period, Safavid kings were closer to Shia faqihs more than any other time and supported their power against other religious groups such as Sufis and philosophers. At the beginning of the kingdom of Sultan Husayn Safavi, al-'Allama al-Majlisi asked him to give orders about breaking the idols of Indians living in Isfahan, prohibition of drinking alcoholic drinks, prohibition of playing with doves and stopping tribal fights. These actions were evaluated by Shi'a writers as measures for religious reformations and fighting with social corruptions, but some western researchers criticized some of these actions such as prohibition of drinking alcoholic drinks, prohibition of playing with doves and restriction of Indians and considered them examples of useless harshness which led to wide social objections. Some western writers accused al-'Allama al-Majlisi of harassment of religious minorities. They accused him of forcing Sunnis to become Shi'a and being harsh on religious minorities such as Zoroastrians, Jews and Christians; while, according to some researchers, there are no clear historical evidences to support such accusations and some of them are the result of evident mistakes mentioned in the works of orientalists. Perhaps the most important reason for illustrating a biased and harsh picture of al-'Allama al-Majlisi was the reports mentioned in some historical sources about his fights with Sufism and closing the places of their gatherings and exiling them from Isfahan. Some researchers spoke about killing and massacre of Sufis by the order of al-'Allama al-Majlisi. Accuracy and authenticity of these reports have been doubted by other researchers. Although there is no doubt about the fight of Safavid government and faqihs with Sufism at that time, the fight of al-'Allama al-Majlisi with Sufis was limited to writing some works in criticism of their manner. Some said that introducing al-'Allama al-Majlisi as a prejudiced and harsh faqih has roots in the works of orientalists and is due to their affinity toward Sufi movement. Total cooperation of al-'Allama al-Majlisi with Safavi kings and also praising Safavid kings which is mentioned at the beginning of some of his works led to some criticisms. It should be noted that at the time of Safavids, many Shi'a scholars cooperated with Safavis government. These scholars regarded the establishment of a Shi'a government positive. In their view, although this government did not have the same legitimacy of the government of infallible Imams (a), but they could make the grounds for the freedom of Shi'a and the establishment of religious rulings. Thus, Shi'a scholars considered it necessary to benefit from the opportunity of establishment of Safavid government and mentioned some opinions in political Shi'a fiqh to rebuild theoretical principles of cooperation with governments. On the other hand, supporting Safavid government was somehow an effort for strengthening this government against Ottoman government which had begun to rebuild Sunni caliphate in their neighborhood and there was always the danger of their victory over Safavids and thus renewal of their harshness toward Shi'a. In any case, many people and scholars such as Al-'Allama al-Majlisi so much trusted Safavid government that sometimes, believed that it was the government which would prepare the grounds for the coming of Imam al-Mahdi (a). However, a group of scholars referred to the theory of impermissibility of cooperation with oppressor government which was the prevalent theory of political Shi'a fiqh and withdrew from politics. During the life of al-'Allama, some Shi'a ulama criticized his manner and objected to some of his actions such as his leadership of Friday prayer, which they regarded it specific to the time of infallible Imams (a). About him, it is said that he was the first person who taught hadith sciences in Safavid era. Al-Shaykh al-Hurr al-'Amili says, "He paid attention to all sciences and studied them carefully." Muhammad 'Ali Ardabili praised him greatly. Mirza Muhamamd Tunkabuni says, "His Haqq al-yaqin alone made 3000 of Syrian Sunnis convert to Shi'a." The Sunni scholar 'Abd al-'Aziz Dihlawi, who wrote books against Shi'a, said, "If Shi'a is called Majlisi's religion, it would be fine; that was he who promoted this school and before that it was not influential." Writing different books in different topics of fiqh, exegesis of Qur'an, theology, hadith studies, history, du'a and prayers, and writing the hadith encyclopedia of Bihar al-anwar and collecting hadiths and categorizing them. Writing and translating some religious texts in simple Persian for common people. Issuing fatwa and answering people's religious questions in the most simple ways. Religious reformations and fighting with centers of corruption, idol houses, and fighting alcohol drinking. Establishing Friday prayer, congregatioal prayer, religious gatherings, and speeches. Accepting the position of judgment and being Shaykh al-Islam at the time of Shah Sultan Sulayman and Shah Sultan Husayn and using his influence for establishing Shi'a beliefs. 'Allamah Majlisi's works in different topics which exceed 70 topics in Persian and Arabic. 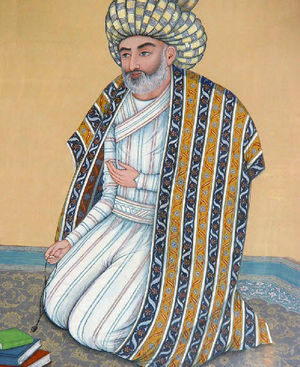 Aqa Buzurg Tihrani counted Majlisi's works as 169 volumes. Bihar al-anwar in 110 volumes which is considered the great encyclopedia of Shi'a hadiths. Mir'at al-'uqul as a commentary on al-Shaykh al-Kulayni's al-Kafi in 26 volumes. Maladh al-akhyar fi fahm tahdhib al-akhbar as the commentary on al-Shaykh al-Tusi's al-Tahdhib in 16 volumes. Hayat al-qulub on the lives of prophets (a), the Prophet of Islam (s) and Imams (a). Hilyat al-muttaqin on the manners of socializing and recommended actions in individual and collective lives in Persian. Muhammad Baqir al-Majlisi passed away in the eve of Ramadan 27, 1110/March 29, 1699 in Isfahan at the age of 70. He was buried beside the Grand Mosque of Isfahan beside the grave of his father according to his will. The material for this article is mainly taken from محمد باقر مجلسی in Farsi WikiShia. This page was last edited on 9 June 2018, at 22:28.